As the world's leading belt manufacturer, Gates has a long history of creating new products to meet constanly evolving requirements. Gates now offers an OE equivalent aftermarket replacement scooter belt: Gates Powerlink®. As the world's leading belt manufacturer, Gates has a long history of creating new products to meet constanly evolving requirements. 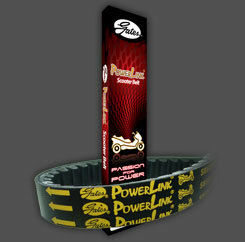 Gates now offers an OE equivalent aftermarket replacement scooter belt: Gates Powerlink®.